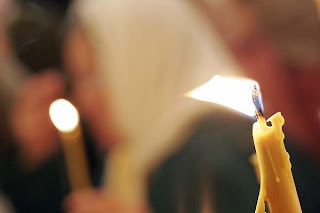 April 26 is the anniversary of the Chernobyl disaster. 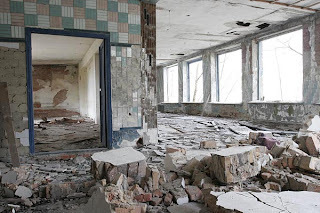 I spent the day touring the Chernobyl exclusion zone with the crew behind pripyat.com, a website devoted to the history and news from Pripyat. 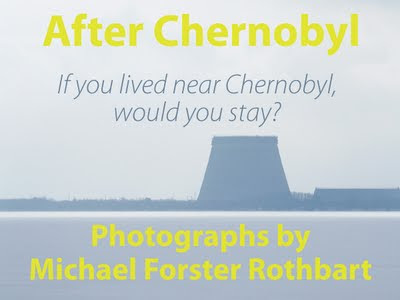 Pripyat, the city adjacent to the Chernobyl power station, had 46,000 residents. All that now remains are the slowly crumbling buildings. Anything of value has been destroyed or stolen in the past 21 years. Vlad Vitvitskiy showed me around the Solnitsye kindergarten where his brother and sister attended school. My wife Amy thinks this photo is cliche. 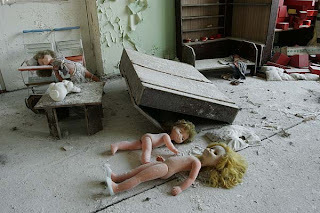 She says anyone who has seen photos from Chernobyl has already seen photos of abandoned toys scattered across the classrooms. Perhaps, but I found the hastily abandoned toys and pillows and baby shoes quite affecting. To think that the children who played here have either died or grown up to have kids of their own. Were these dolls abandoned in this position, mid-play, or did someone rearrange them over the past 2 decades? Hard to say, but they've been there long enough to collect a layer of disintegrating ceiling tile dust on them. The red blocks on the right have most likely gone untouched for over 20 years. 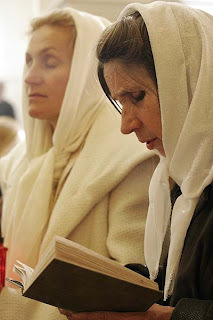 I have many photos to share from the day; I will post more as I process them. Boris Yeltsin, Russia's first (some would say Russia's only) democratically-elected President in 1,000 years, died yesterday in Moscow from heart failure. Here is an irreverent photo I took of him in 1999, shortly before he left office, while he was playfully scolding a journalist. I met him twice, and both times I found him boisterous but very genial. Yeltsin was a dedicated reformer, but left power with a mixed record: he lead Russia forward in democracy and free speech, but he also moved too hastily in privatization and it was he who started the wars in Chechnya. Still, I find it telling that his old political enemy Vladimir Zhirinovsky said yesterday that Russia "was never freer than it was under Mr. 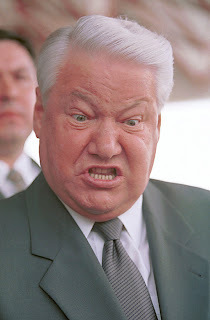 Yeltsin." Ukrainian author and Chernobyl liquidator Sergii Mirnyi speaks during a reading of his most recent screenplay. Mirnyi is working to produce a comedy feature film about the lives of soldiers cleaning up after the 1986 Chernobyl accident. During decontamination efforts, Mirnyi served as commander of a radiation reconnaissance platoon in the exclusion zone around the Chernobyl Nuclear Power Plant. Note: although I've been wanting to photograph Mirnyi for awhile, I hadn't planned to shoot at this event until I saw the great lighting in the theater. 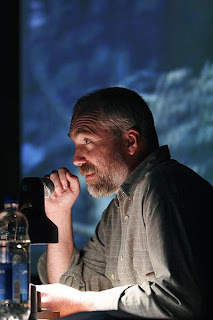 Foreground: a bare light bulb shining down, reflecting off of his papers; background: digital projector images from Chernobyl. Tech info: 1/100 at F2.8, 70-200mm on monopod. Color balance set to incandescent to blue the background. 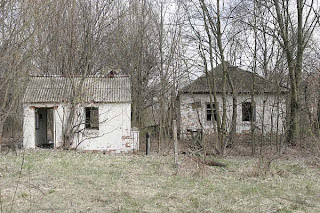 Bober, an abandoned village near Chernobyl, on the road between Ivankiv and Ovruch, Ukraine, contains little more than the shells of former buildings, including houses, one school and two local government buildings. The ceiling is crumbling in this structure, which appears to have been a grocery store. 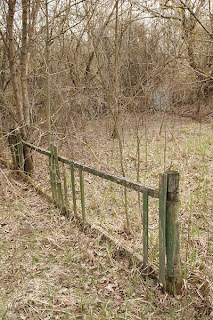 Although outside the initial 30 km exclusion zone evacuated after the Chernobyl accident in 1986, the village was later deemed contaminated and all the residents were resettled in less radioactive areas. Overall, some 135,000 people were relocated. Everything with any value has since been stripped from the buildings, including even windows and wiring. 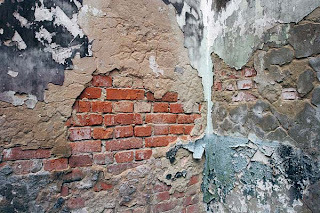 Here, paint and plaster peels off the brick walls of a classroom. The forest is taking over the yards and the roads are slowly disappearing, but the daffodils are still preparing to bloom in former gardens. 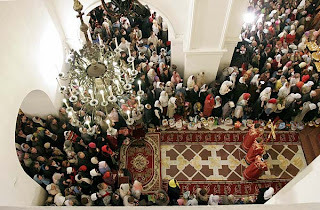 I attended an easter service at the Perchersk Lavra monastery, where people crowded in as best they could into two adjacent churches to participate in the all-night mass. 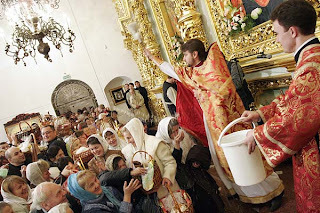 (Masses for the masses?) An overflow crowd filled the square outside. 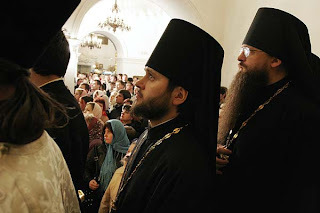 Two priests stand at attention in the Church of the Assumption (Uspensky Cathedral) at the start of an Eastern Orthodox Easter service, shortly before midnight on April 7, 2007. That many people, lit candles and flammable Easter baskets all crammed into one building struck me as a bad idea, but apparently no one else minded. I know, I know, a thousand words. They say that's the market value of a photo. But what if I don't want words? Fug me. I'm not in a happy mood and here is the reason: while I was photographing these children, playing in front of their apartment building, my camera bag was stolen off the playground. I berate myself. I was too absorbed in what I was doing. Although my bag was on a bench only 5 meters away, that was 4 and 1/2 meters too far. What's in your bag? It's a game photographers like to play with each other. I'll tell you: there's more in there than I realized. I made a list for the insurance company of 41 things that were in my bag, ranging from pricy lenses to the inexpensive but hard-to-replace notes from an interview this afternoon. (I'll post the list here later). 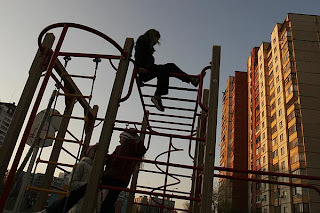 A group of ten-year-old children play on the small playground outside their apartment building on Mayakovskogo Prospekt. Most of the evacuees from the Chernobyl nuclear power plant accident were relocated here to the Desnyanskiy district at the outskirts of Kyiv. 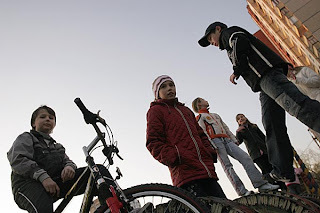 More than twenty years later, nearly half of the 46,000 former residents of the city of Pripyat still live in Desnyanskiy raion, where they struggle with health problems, unemployment, little government support and overflowing apartments, in which three generations of extended families often live crowded into a two room apartment. While the sun was setting and I was laying in the dirt taking this photo, my camera was being stolen behind me. Supporters of Ukraine's Prime Minister Viktor Yanukovich rallied this morning, April 4, outside the Verkhovna Rada (Ukrainian Parliament) building in Kyiv. 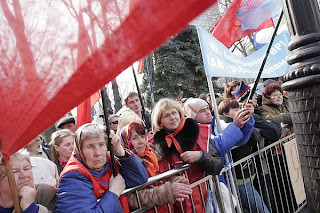 A crowd of perhaps 2,000, including these women from Kirovohrad oblast, waved flags and listened to speeches, while many more lounged in the adjacent park. Later, the protestors marched down the hill to Maidan Nezalezhnosti (Independence Square) where a larger rally was held in the afternoon. As it got underway, Jacob and I left to go find diapers and a nap. The two questions I've been asking: where are all of President Yushchenko's supporters? 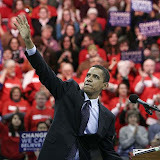 And will these demonstrations change anything? No one seems to know. The first stage in resolving the immediate Parliamentary crisis lays with the Constitutional Court, which is not known for its speediness. Within 2 weeks they will decide whether or not to consider the case. But even if or when the court rules, how will the country ease ongoing tensions between Russians and Ukranians? (For more background information see the next post). Ukraine has a historic divide between European-focused western Ukraine and Russian-leaning eastern Ukraine. Those simmering tensions have escalated this week after (western-oriented) President Viktor Yushchenko announced he was dissolving the Parliament and plans to hold new elections in May. This current Parliamentary crisis is the latest in a long battle for power between Yushchenko and his chief rival, Prime Minister Viktor Yanukovich. Both the Viktors claimed the other Viktor had broken the law: PM Viktor for buying influence, and Pres. Viktor for using that as a reason to disband Parliament. Jacob and I today went out to see what we could see. 1. Get yourself a good campsite. 3. Bus your supporters in from all over the country. 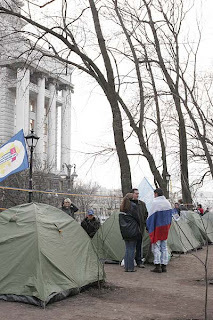 A group of protestors from Kherson, near Odessa, were set up in tents behind the Parliament, overlooking the Cabinet of Ministers building. *1 We saw men unloading dozens of new sleeping bags and pads from a new Toyota Land Cruiser, for example. Someone has put a lot of money into this campaign. 5. Sit around, drink tea, smoke, hang out in the park, and wait and wait for something to happen. 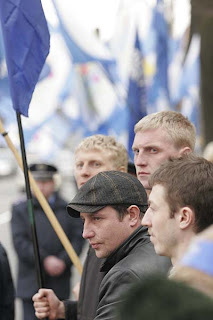 Members of Yanukovich’s Party of Regions and other protestors listen to speeches outside the Verkhovna Rada (Ukrainian Parliament) building on April 3, 2007. *2 The US embassy warned Americans “to be aware of their security and to avoid large public gatherings and demonstrations.” Which was kind of funny to me, since this gathering was about as dangerous as Shakespeare in the Park. The only danger we faced was (1) listening to the blaringly bad music and (2) the old women from Donetsk who wanted to smother Jacob. “His hands are cold,” they said. “His cheeks. Where is his mother?” It was a frosty 57 F.
Leonid Brustman, a computer repairman from Kherson in southern Ukraine, traveled by bus to join today’s protest. “That would be a good idea, to start an impeachment against Yushchenko,” he said. 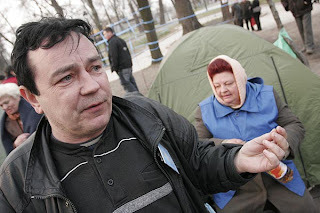 “Actually, all of them are crooked.” Yanukovich's Russian-leaning supporters filled Kyiv's parks today, setting up tent encampments and vowing to keep 24-hour vigils, tactics copied from Ukraine's 2004 Orange Revolution. To me, the whole events looked queerly choreographed. The fancy banners, the rows of identical tents: this is no home-grown protest movement, this is an orchestrated political campaign. I wonder if the participants felt like pawns in a political game? Yet despite reports of students being ordered to attend, most people I saw looked happy to be there. 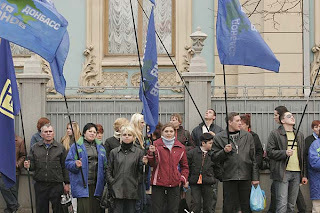 The protestors gathered in Maidan Nezalezhnosti (Independence Square) and the park around the Parliament. Meanwhile, the life of Kyiv continued as normal. One block away, the suits and ties piled out of their offices and into the evening rush hour. Two blocks away, around Arsenal metro station, the women who always advertise furniture were still advertising furniture, the lovers were doing that spring thing with their hips and their lips, and the teenage boys were doing tricks on their bikes and their skateboards. Tomorrow there is a larger protest called. I’ll post again — if I’m done working on the taxes.